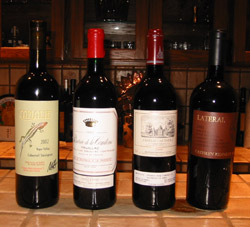 On 4/29/06 a group of 17 Addison Parents blind tasted 8 wines at Carolyn Blatman's party. The wine coop wine from barrel WC5 came out on top again! Here are the scores and the wines. We did our second bottling of the 2002 vintage on 3/30/04. Gary, Cindy and I did the bottling of the 26 gallons of wine in barrel CV2. The bottling yielded 10 cases plus one bottle. The total wine then in one of the 60 gallon barrles is exactly 26 cases. This means that the total volume of 2002 wine is 78 cases, half of which is wine coop wine: 39 cases. Camalie provided about 10 gallons of topping wine which was fully used so Camalie should get a little more than half but, for now we will ignore this offset. 14 cases minus one bottle came from barrel WCCV6 and 2 cases from barrel WC5. We pumped 26 gal. of barrel WCCV6 to barrel CV2 and then bottled all but 2 cases of WCCV6. We then bottled 2 cases of WC5 and siphoned the rest of WC5 into barrel WCCV6. Barrel WC5 was removed and cleaned for use with the 2003 vintage. Although half of barrel WCCV6 is Camalie wine we took only about 30% to enable most people to have a few cases for gift giving this year. When the rest of WCCV6 is bottled in the future the split will be adjusted to ensure each member and Camalie gets their appropriate share. Note that 26 gal. of the wine from barrel WCCV6 is now in barrel CV2 and all but two cases of WC5 is now blended with two cases of WCCV6 in barrel WCCV6. If you are having trouble keeping track of this you are not the only one. 11/20/03 We did a prototype taste test of WCCV6 with its acidity boosted from 5.6g/l to 6.6 g/l. We blind tasted it against unadjusted WCCV6 and a Cabernet Sauvignon from PageMill Winery. Six people tasted, Gary,Carmen, Tim, Mike M. Mike J. and myself. We each ranked the three wines. Scoring a first place 2 points, second place 1 point and third place 0 the wines had the following scores. Our conclusion is that acid adjustment of WCCV6 is not warranted at this time and hence there is no reason to delay in bottling half of barrel WCCV6. If the acid adjustment had been an improvement then we would have gone ahead and adjusted the acidity and waited for it to integrate. Bottles have been ordered and should be ready for pickup on 11/24/03. One of the motivations for bottling some now is to have some wine available for gift giving over the holidays. The wine has aged most of the summer up around 70F rather than target 59F so it can be rationalized that maybe the wine has sufficient aging already. Since we are only bottling 1/6 of the total vintage the risk of early bottling is modest. Sampling done before topping. Sampling done 1.5 days before analysis. Put in small plastic vials with 25% headspace of air. The acid adjustment results are mixed. CV57 was corrected more than expected, WCCV6 was not changed at all, and WC5 was improved but not as much as desired. pH's did drop significantly in all cases which will make the wine more robust to microbial contamination. Taste wise the balance was significantly improved. Also of note the alcohol levels all dropped by .3 to .5%. 5. +6 Toscana Mezzapana Super Tuscan blend. Conclusion: The 2002 vintage is coming along very nicely. We still don't like French Wines. 8/10/03 Upward acidity adjustment made. Goal is to bring all three wines to 6g/l T.A. The pH is dangerously high on WC5 and its TA is quite low which indicates it needs an acid adjustment immediately. Plan is to do this 8/10/03. Target will be to bring the TA to 6.0 g/l which is the bottom end of the recommended range for reds. I also plan to adjust CV57 to 6.0 g/l to improve its balance and give it more substance. I plan to leave WCCV6 alone for now for reference in future tastings to make it clearer what effect the acid additions have had on the other two barrels. Oddly the 2002 vintage has exactly the opposite acidity problem of the 2001 vintage which was too high in acidity. Picking the grapes later is likely one reason. The Potassium Carbonate residue that was left on the Domaine Chandon grapes is likely a cause of the WC5 having the lowest TA. On 6/27/03 and 6/28/03 Gary and I moved the wine from our garages to Gary's Basement. It took us about 8 hours of work to make this happen. This was done after recognizing that the temperature of the wine was getting too hot during the day especially after two very hot days on 6/25 and 6/26. The wine temperature was measured at 78 F in Gary's garage and at 75 in the Holler garage. The peak ambient temperature in Gary's garage was measured at 102 degrees. He has fewer trees shading his garage. The temperature in his basement ranges from 71 to 72 degrees as measured in the last couple days. The wine was pumped to the stainless tanks, the barrels cleaned and moved and finally the wine allowed to flow by gravity down into the barrels in his basement. Some sediments were removed as the wine was transferred. We tasted to select topping wine on 6/26/03. See tasting notes at Topping Selection 2003. The three wines we selected for topping use were Raymond Amber Hill 2000, Bear's Lair and Forrestville-Ca. 12/9,10/02 Gary, Tim and I moved the wine from the tanks to barrels. We lost about 20 gal of volume in the form of lies left behind taking us from 210 gallons total to 190 gallons. Both Camalie and the Wine Coop suffered about equal losses. As a result the wine filled three large barrels (60gal) but did not fill a full half barrel in addition. About 15 gallons is left in a stainless tank which will be used for topping. This topping wine is mostly F with a little C and D as well. The three barrels consist of the following wine and are labeled as follows. WC5 was sulfited with .56g/l at transfer time due to it's high pH, to prevent spoilage. On 12/7/02 We did the barrel Mix tasting. Barrel WC5 = Lots A,B 34g. + 32g. = 64 gal. Barrel CV57 = Lots E,H 28g. + 31g. = 59 gal. Barrel WCCV6 = Lots C,D 34g. + 42g. = 76 gal. Tank F = Lots F, leftover from AB and CD 14g. + 5g. + 7g. Leftover expected = 10g for topping. 11/14/02 Measured Total Acidities (TA) for the rest of the lots. Results are listed in the table below. TAs are much lower than last year in general which is good. They were excessive last year. pHs are also much higher than last year and are generally higher than desirable which is a risk factor for microbial contamination. 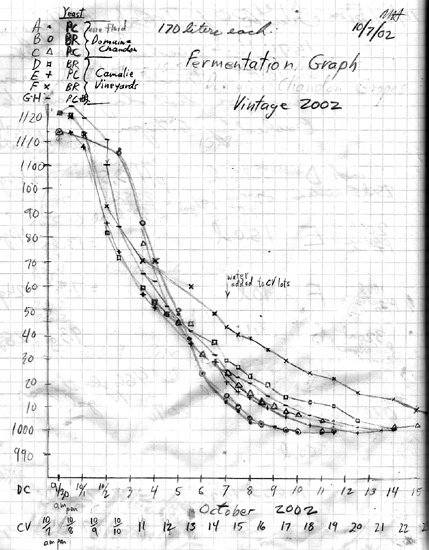 The Domaine Chandon grapes generally have higher pHs than the Camalie grapes, probably due to Domaine spraying the grapes with potassium carbonate which was some of the white residue on the grapes according to Katey at Domaine. Interestingly the Camalie Vineyards grapes have as much and even more acidity in one case than the Domaine Chandon Grapes in spite of being diluted 13%. Tasting the degassed wines is also interesting. The lowest Acidity lot, A is quite bitter and astringent without much acid taste. Not too well balanced. Will need some blending probably. 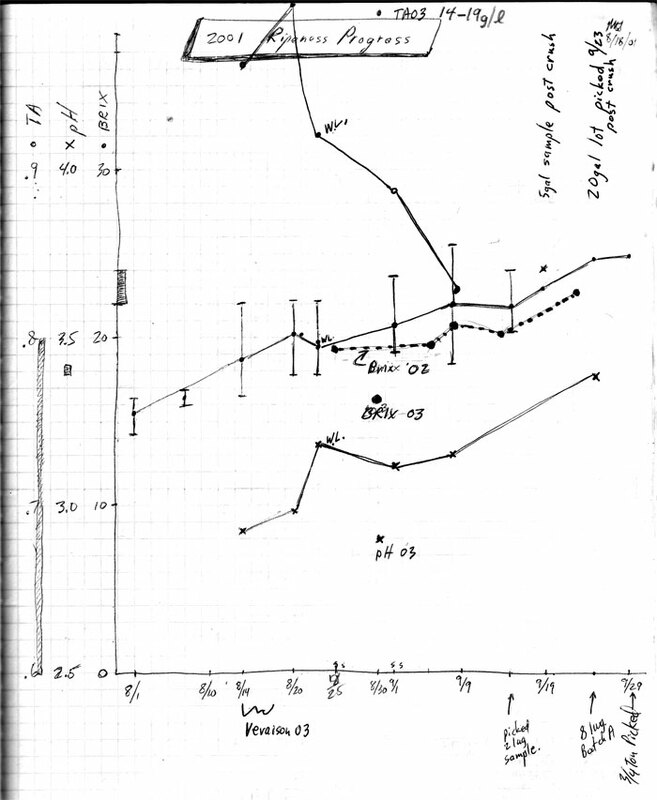 I was able to detect that F had the highest acidity before the TA measurements. C we agree has the biggest flavor which is consistent with its acidity. The mouth feel is much less agressive when it is degassed. 11/11/02 Bought 3 barrels from distributor of Quintessa Tonnellerie in France. Total cost $1380.00. Two are made from French oak and one from American Oak. All are Medium + toast. Also bought two barrel racks. 11/9/02 MLF innoculations done to H, A, B, D, E, F. Leucofood and Leucovit added. Bottled 5 bottles for Gary's retirement party, evaluation samples of A,B,C, H, and CV2 after acid reduction. All 5 drunk by the party guests. Wine Inventory taken: A = 34.3 gal. B= 32.2 gal. C= 34.4 gal. D= 42.2 gal. E= 28.3 gal. F= 14.5gal. H= 31.2 gal. DC total 100.9 gal, CV total 116.2 gal. Grand total 217 gal. Friday 11/1/02 9:00am We pressed Lots E,F and H. Gary, Tim, George, Susan, Adam and Mark all participated making the job go quickly. The fermentations and pressing is Done. We were done by 11:30am. The smallest lot, F, was somewhat sour and one dimensional in my estimation. H was the biggest and F had the dusty, more bitter astringency than F like A which was also done with Premier Cuvee Yeast. We tasted also C and agreed that it had the most astringency and flavor. It was fermented with Bordeaux Red Yeast. Only a blind tasting will tell for sure but, we are starting to get a handle on the differences between the lots. We agreed the tasting to decide on how to blend in Barrels will be on the weekend after the Thanksgiving weekend. 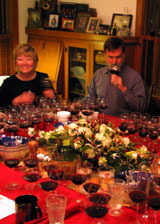 George and Susan have graciously volunteered to host the party on Saturday December 7. Friday 10/25/02 Gary Bacon and I Pressed lots D and B which yielded 42 and 34 gallons respectively. Three lots remain to be pressed. Tuesday 10/22/02 Punched down F which is the only lot which has not reached completion of fermentation. Its S.G. was 1013 yesterday. Bottled one case of Pear wine and put the rest in a smaller carboy to reduce headroom. Since sampling 10/18 it had developed white colonies of bacteria on top, probably acetic acid bacteria. Monday 10/21/02 10:00pm Camalie Vineyards pressings are essentially complete except for F which is in the small tank and has been cooler and slower all along. It has about 1.5% alcohol to go. Alcohol measurement on lot H shows that the desired alcohol target was exactly achieved by the water additions. 14.6% alcohol was measured for the Camalie Vineyards Wine. Many thanks to George and Susan and Tim and Glista for punching down and measuring the Camalie Vineyards must these three days Cindy and I were gone. Pressed off Tanks A and C trying to reduce maceration time and make some lighter wine this year. A was more fluid already due to being taken from the tops of B and C and C was already more astringent due to the use of Bordeaux Red Yeast. Here's the group breaking up the cake after a pressing. We pressed too times. We also smoked the drain pump. Tuesday 10/15 10:00am. Punched down and took specific gravity measurements. Camalie Vineyards musts are still advancing at about the same rate. The Premier Cuvee lot is approaching completion. A B and C are done fermenting although C may have a little residual sugar with its SG of 1003. I couldn't taste it. Punching it down I saw some foam indicating it is still fermenting though the SG hasn't changed in a couple days. Plan is to Press A and C this Thursday and B next week sometime. I brought the press down from Napa last Sunday. Alcohol levels are high as expected but are not unreasonable. Hopefully some alcohol loss during aging will occur as I believe the alcohol evaporates faster than the water though alcohol has a higher molecular weight than water and may not penetrate the barrel walls as easily as water. Some research is needed. Anyway when wiping down the walls of the tanks use a sponge to wipe up and remove the alcohol on the sides. The Camalie Vineyards fermentations continue at about half the rate of the Domaine Chandon grapes due either to temperature or the absense of yeast food until today in the Camalie lots. Should be interesting to see the differences though this variable will be confounded with the vineyard location variable. I added yeast superfood to all Camalie Vineyards lots today in the same quantity as done previously for the DC lots, .5g/liter. Should have added this earlier as the Camalie Vineyards lots are going to have even more alcohol than the DC lots. The initial Specific Gravities were 1114 and 1122 for DC and CV respectively. This difference should correspond to 1.2% higher alcohol levels for the CV lots which would put them up at 16.4%. It is fairly likely that the fermentation will have difficulty going to completion at this alcohol level. As a result I made a water addition to bring down the sugar level and later the alcohol level for the CV lots. Commercial wineries aren't allowed to do this but, us home winemakers can. To reduce the end point alcohol level to 14.5% from 16.2% the wine was diluted at a rate of 13.1 liters/100 liters of wine. The good news is that this produces another 15 gallons of wine. Wednesday 10/9/02 Most of the day. Cleared garage to put in a new 300 liter stainless tank to take the must from the garbage can (94 l) and the larger plastic tank with 150 liters in it. Some will come out of the smaller tank and tank D which are bumping up against their lids at every punchdown. Built a tank stand for the new tank. Wednesday 10/9/02 6:15am Punchdown all tanks. A and B down to 1002. Tuesday 10/8/02 8:00pm Punchdown all tanks. All fermentations still going though A and B have slowed greatly. They are almost dry at a specific Gravity of 1003. Tuesday 10/8/02 9:00am Punch down all tanks. CV must starting to work based on CO2 venting but, specific gravity hasn't changed much. 2/3 of the Domaine Chandon Must is almost through fermentation though. See graph Labeled 1.5 cases of CV3 that we bottled last week. 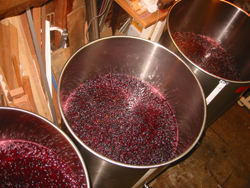 Monday 10/7/02 7:30pm to midnight punching must and innoculating the 4 tanks of Camalie Vineyards must. Also a fair amount of clean up. Sunday 10/6/02 11:15am Punching down all three Tanks. M.H. Specific Gravities of 1014, 1024. The wine is now 13.7% alcohol by my best estimate. So of course I had to taste it. My opinion biased by my cellar palate is that it is tasting very good already. Lots of fresh fruit berry flavor. Like Grape juice without the sugar but, spiked with alcohol. Like a Beaujolais Neuveaux. Trucked grapes down from Mt. Veeder in old Toyota pickup. It handled about 1300lbs of grapes in two bins relatively well. Some of the grapes came back in the backs of cars. We exceeded our winery capacity by about 15% and had to go and buy a 32 Gallon plastic garbage can to hold the last of the must. Coincidentally this is tank G. Total must put up in this day's crush was 559 liters or 149 gallons. Last year we put up 466 liters or 124 gallons. This is 20% more must from the half acre this year than from the whole vineyard last year. Surprisingly the Camalie grapes are much more dense than the DC grapes because we filled only a bin and a half with them compared to 2 bins of DC grapes yet ended up with 174 lbs. more grapes. Total must now in the "winery" is 1060 liters or 282 gallons. This is about 2820 lbs of must or almost a ton and a half. 3:00pm to 7:00pm Crushed grapes with the whole crew shown above, minus George who wasn't feeling well. This day we picked grapes from Camalie Vineyard on Mt. Veeder. Total weight picked 1574 lbs. After estimating Must volume this looks like about 20% more grapes than last year from this vineyard plus another 3.5 acres of vines which are now gone. Ramon's stewardship of the vines really paid off. The quality of the grapes is also much better. No mildew, no black grapes. Brix level was 23.9 on average essentially identical to last year's harvest. The Domaine Chandon grapes were also almost ideal at 24.3 Brix average. Punch down. Looking good. Less Hydrogen Sulfide Smell. Punched down all tanks. Punching vigorously allowing must to drop off of paddle from 12" above the must to aerate as much as possible. Punching until there is a good layer of red foam over the entire top surface. Must Temp in Tank A is 77 F. The Bordeaux Red yeast is fermenting more quickly than the Premier Cuvee which is opposite to what happened last year. Punched down all three tanks. Ambient temp 62 F in garage. Temp on surface of tank B 67F indicating must is definitely heating up the garage. Last year we fermented at lower temps like this. Most winemakers let the temp go to 80 degrees to get done with fermentation faster and free up the tanks for another batch. With Bigger tanks you have less surface area/volume and it is hard not to get to the higher temperatures. The higher temps I believe will extract more phenols from stems and skins and make the wine more harsh and bitter. I believe we should take advantage of our smaller tanks to ferment at lower temps to get a less harsh wine as a means of differentiation. Punching down all three tanks, A,B,C. Cap is rising 4-5 inches between punchdowns now. Fermentation is heating up. Specific gravity is down to 1107 from 1114 indicating that the alcohol level is now up to 1%. Ambient Temp 70 degrees F. We added 22g of Yeast superfood to each tank in anticipation of the yeast having a hard time when it gets to the higher alcohol levels expected because the sugar content of the grapes was quite high. Bottled 10 cases of wine from barrel CV3 of the 2001 vintage with the help of great friends Gary and Tim. Martha helped wash bottles. Completion of Malo Lactic fermentation really brought this wine around. It is close to the quality of barrel CV1 but, even bigger, more astringent. This one should inprove with age for several years. Fermentation is proceeding nicely in all three tanks. The cap is rising. Lots of CO2 bubbling up as we punch down the cap. Nice smells. Need some time to do analytical work. Thanks so much to everyone who helped pick grapes and/or helped with the Crush this weekend. It couldn't have been done without you. The fun has just begun! We picked 1418 lbs of Cabernet Sauvignon grapes (French clones) from the Domaine Chandon vineyard below their main reservoir on Mount Veeder. Average Brix was 24.3. This was the first yield from these 3 yr. old vines. Six people picked the grapes in 5 hrs. They fit in two bins on the back of a pick-up truck. I learned that the open clusters of Cabernet Sauvignon are significantly less dense hence their lower packing density and higher resistance to mildew. Usually each bin will hold 1000 lbs. of grapes. In this case they only held 700 lbs each. Our target was to pick a ton but, as it turns out a ton would have been too much as we have filled 3 of the 4 tanks with what we picked and we still have the Camalie Vineyard to pick. The must has a pH of 3.69 which is a little on the high side. The specific gravity was 1114 which is also a little on the high side. This wine will have plenty of alcohol. We will have to worry some about having a stuck fermentation as the yeast doesn't like alcohol levels above 15%. The Brix reading by the hydrometer was 28 but, it is usually higher than the refractometer which indicated Brix of 26 in the field the day before we picked. On 9/29 we crushed into tanks B and C filling each with 255 liters of must for a total of 510 liters or 136 gallons. That evening we added 29.6 g of sulfite to each tank targeting 50ppm of free SO2. Today, Monday, 9/30/02, I cleaned the third tank and transferred some must from B and C to A to a level such that all three now have 170 liters in them. The tanks are all 2/3 full now which should give adequate room for the rise of the cap with buildup of CO2. This is based on last year's results. In transferring the must to tank A we bucketed from the tops of B and C and ended up getting more juice than berries as observed in punching down. We keep picking stems out; the must is looking good but sticky as syrup with all the sugar. I inoculated tanks A and B with 41.6g of Premier Cuvee Yeast and tank C with a similar quantity of Bordeaux Red Yeast.